Dear old dad loves an interesting book. It’s marvelous how our father’s know things. We count on them to give us good advice and share their wisdom about the world. They are informed, probably opinionated and always loveable. Here are some fascinating books that will engage a father’s curiosity, provoke his mind, and perhaps even enlighten his thinking. Pandemics, Pills and Politics: Governing Global Health Security by Stefan Elbe (John Hopkins University Press, 280 pages). The author is the director of the Centre for Global Health Policy and a professor of international relations at the University of Sussex. This book is the first in-depth study of the world’s most prominent medical countermeasure, Tamiflu. Taken by millions of people around the planet, the Tamiflu vaccine harbors deeper lessons about the political, economic, legal, social and regulatory tensions that emerge as 21st century security policy takes a pharmaceutical turn. Elbe takes a look at the rise of a new molecular vision of life that is reshaping the world in which we live. We love our refrigerators. But before the fridge, there was the ice-box. This is a fun book on how Americans built a complex system to harvest, store and transport ice to everyone who wanted it. The author follows the evolution of the natural ice industry and it’s impact on the country, food production and technology. This is a very cool history book! With about 40,000 commercial aircraft taking off and landing safely each day just in this country, it is by far the safest form of travel. But when something goes wrong, it is terrifying and often deadly. The authors share riveting stories about both hi-profile and lesser-known airplane accidents. From human error to mechanical failure, this book looks at everything that can go wrong and the principles and procedures to finding the answers so it won’t happen again. Words shape us and the way we interpret the world. Beyond the words we speak, we now use words to initiate searches. Google “best car made in America” and over two billion results come up. To refine your search, more accurate words need to be applied. The author argues that sophisticated search tools coupled with growing full-text digital archives, make it newly possible to study the histories of linguistic form. Challenging a range of received metanarratives and complicating some of the most basic concepts of literary study, this book asks scholars of literature, history and culture to revise nothing less than their understanding of the linguistic sign. 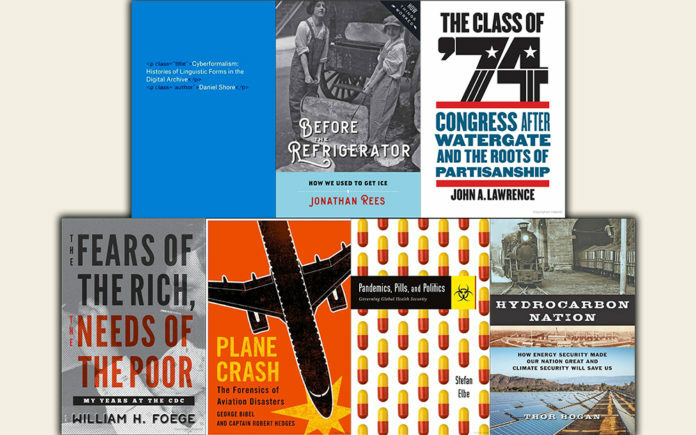 The author looks at how four technological revolutions – industry, agriculture, transportation and electrification – drew upon the enormous hydrocarbon wealth of the US, transforming the country into a nation with unparalleled economic and military potential. Fossil fuels created the modern world, but burning them created a climate crisis. Everyday Americans and policymakers must embrace the complexity of this contradiction in order to help society chart a workable path forward. The author explains that in doing so, it will launch a critically important sustainability revolution capable of providing energy and climate security in the future. Over 70 years, the Centers for Disease Control and Prevention has evolved from a malaria control program to an institution dedicated to improving health for all people across the world. Public health luminary Dr. Foege, shares the pivotal moments in public health. He describes the work required behind the scenes and the tensions between professionals in the field and the politicians in charge. Following the historic Watergate scandal, Americans went to the polls in November 1974 to fix American politics. Dozens of GOP legislators were swept out of the House and replaced by 75 reforming Democratic freshmen. The author examines how the newly elected representatives bucked the status quo to effectuate unprecedented reforms. The politics in the mid 1970s fueled increasingly bitter battles between liberals and conservatives, foreshadowing contemporary legislative gridlock and a divided Congress. Previous articleAvoid the Summer Time Blues With Sun Safety Tips!